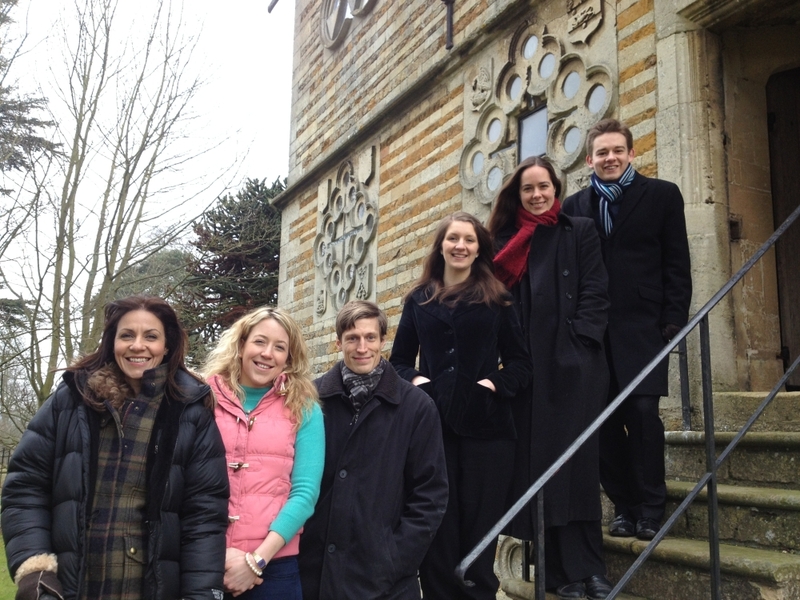 On 7 April 2013 Les Canards Chantants appeared on Countryfile (BBC One) performing a piece of recusant polyphony in the historic Rushton Triangular Lodge. The music survives in a private manuscript of prayers and devotions that belonged to Sir Thomas Tresham, who spent 15 years in prison in the late 16th century for refusing to renounce his Catholicism. Upon his release, he built the Triangular Lodge, a highly ornate and religiously-symbolic folly full of architectural representations of the Trinity, to affirm his faith. ‘Adoramus te, Christe’, with its own trinitarian symbolism in the form of thirty-three statements of ‘alleluia’, would have been intended for performance during secret worship in private spaces like this. Les Canards Chantants initially recorded the motet in 2012 as part of Emilie Murphy‘s doctoral research, singing directly from the manuscript, and also gave a live performance of the piece at the conference ‘Music, Space and Sociability in the Renaissance’, hosted by the Centre for Renaissance and Early Modern Studies in May 2012. 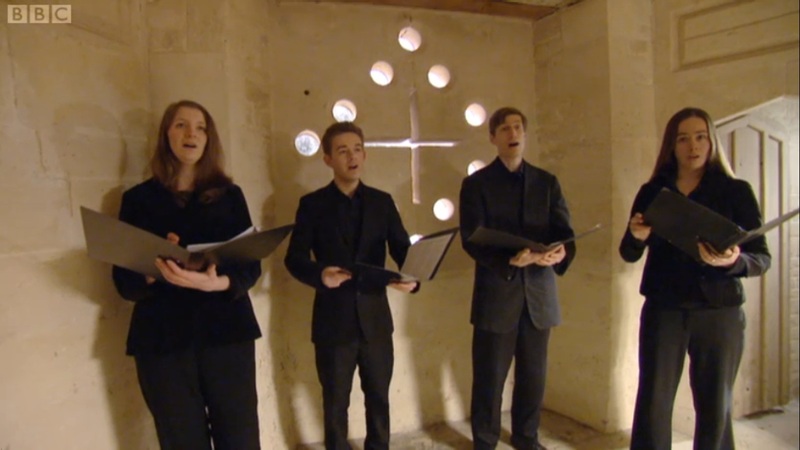 For Countryfile, the ensemble performed the motet from Graham’s new performance edition, using reconstructed historical pronunciation of the sixteenth-century English Latin. 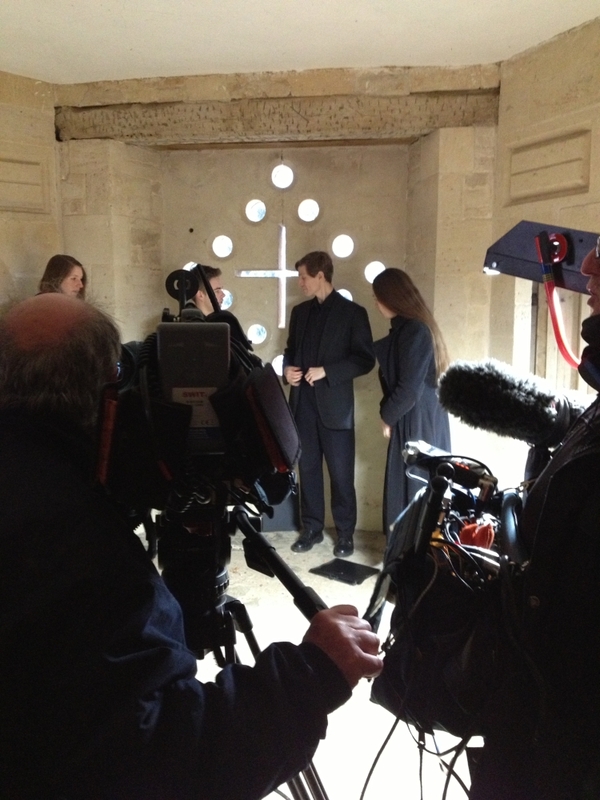 During the episode, the performance became the soundscape and point of departure for presenter Julia Bradbury and Murphy to discuss the symbolism and historical significance of the Triangular Lodge.